From the moment you cross the threshold and enter the grand salon of this historic monument -- now our home, you're transported to a way of life rare to find anymore. The soaring beamed ceilings, the 7 foot wood burning fireplace greet you and your friends with warmth, charm and tres chic comfort. As you enter the grand salon and dining area, you'll rest in sumptuous sofas and chairs from Roche Bobois. Their collection Les Provinciales is rarely seen in the USA, but here in France it's a combination of comfort, ease and elegance. A Sony wifi enabled flat screen TV beams in programming from the BBC, NBC, CNN, Bloomberg and dozens of channels from the UK. And if you use Apple TV, you'll be able to log in and enjoy Netflix and other streaming programs from your personal accounts. Tucked in a 'petit coin' just off the living room is a spectacular 3 story open atrium. Originally part of the barn structure, it's now housing a dramatic 7 foot long fountain, seating for coffee + petit dejeuner or on a warm summers' night a glass of cool rose under the stars. The gas BBQ is at the ready for your 'en plein air' meals and grillades. Glance skyward and you'll see the original beams which housed the various floors of the barn, including a hayloft. All that's left now is an open view of the non stop Provencal sky -- true blue. What makes my home special and different? Each and every year, during the off season we invest in the upkeep and remodeling of the home. That means new linens and bedding, pillows, upgraded wifi, cookware and so on. I'm about to run out of bathrooms to remodel, but am sure to find something new to inspire me and make your stay better. yes, I'm a rehab addict! 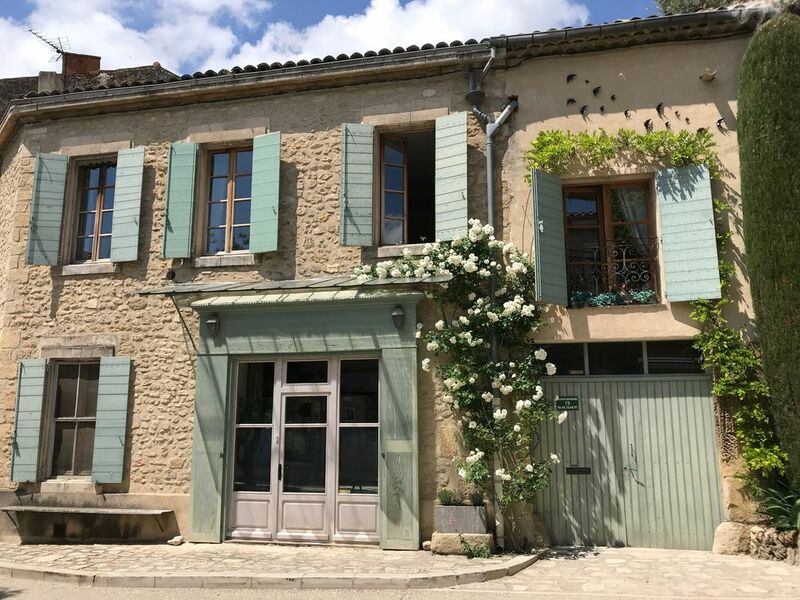 When you watch a charming film such as 'Chocolat' "Amelie" or 'Jean de Floret" and the inspiration to come and spend a week living in a French village excites you -- well, this is the house that will make that happen. From the Boulangerie, the Pizza oven and the 'Bar' on the village square the social hub of old style France, and Provence is at your doorstep. Enjoy the robust, luxurious seasons of Provence. Our village offers the best of artisanal experiences. Savor flavors that will take your breath away. Hike the hills of the Luberon, sample local goat cheese, visit olive oil artisans, and experience markets full of fresh flavors, foods and excitement. The vineyards tell the ever changing stories as seasons shift. Striking colors, flavors and the scents make our corner of Provence and particularly our village a memorable experience. If shopping is your hobby, everyday is a 'shop-ortunity' in Provence. Cultural visits to Avignon, Aix en Provence and Roman ruin are easily managed from our central location. Featured in the French magazine; Maison et Decors, our home is an official historic monument. However -- it's not a museum nor stuffy. All aspects of its' appearance are under the watchful eye of our Mairie. After the French revolution, Ansouis remained 'loyal' to the royals. Our home was the local meeting place and headquarters for those in favor of the new Republique. If you enjoyed the film 'A Good Year,' you'll find yourself walking in the footsteps of Russell Crowe and Marion Cotillard as many scenes were filmed in neighboring villages. in fact, several of our friends and neighbors were extras in the film. 'French Kiss' with Meg Ryan and Kevin Kline shot several key scenes in a nearby vineyard; Val Joanis. The beauty of the Luberon and our local villages are featured in these movies, and now you can experience the same. We have French style airconditioning systems on each floor of the house to take the heat off those sunny and warm Provencal days. Village houses like ours, are regulated and we're not allowed for US standard HVAC systems. Central air is simply not installed as in the USA. We keep our place up -- Each and every year, we put every dollar back into refurbishing, renovating and keeping the house in good working order. This means new Grohe plumbing fixtures, new toilets, baths, renovated kitchen (for which my French friends asked Why?) Well the answer is that I travel non stop for work, and I want to make my home better every time. Maybe it's crazy, but I'm dedicated to continual improvements and so YOU HAVE A COMFORTABLE PLACE TO STAY . You'll sleep on top quality mattresses, with sheets from the USA, Pillows from the USA, Wifi throughout the house, dinnerware from Crate and Barrel, and so on. The house decorated in easy, casual chic. My culinary background and work for a former Food Network and current Michelin chef in the USA, means that our kitchen is fully loaded. It is perfect for cooking great meals with friends. ... 5 unique bedrooms, all with American size towels and 400+ thread count luxury linens. Our beds are high quality - dream beds with anti allergy covers. Need to be connected? We have satellite tv with CNN, CNBC, BBC, etc. We've installed a permanent 'internet' center with free DSL, and a USA laptop/keyboard. The laptop is Skype enabled for free calls 'skype to skype.' We even have iPod docking stations and chargers. Wifi is free, secure and log on information is provided. Hungry, but too tired to cook? You can directly work with a private chef whom will come to the house, or deliver prepared meals directly to the kitchen door. ...Upstairs there is a Large Roof terrace with outdoor dining and BBQ, and mini prep kitchen. Living room is superb, with a 7 foot wood burning fireplace!.... On the ground floor we have an small Private garden with breakfast table - the perfect place for your cafe creme and croissant with the blue Provencal sky peeking over you......inside there is large marble dining table for dinner parties. Ansouis (An-Swee) is officially classified as One of the Most Beautiful Villages in France. Swimming?........Join the locals and go for a refreshing swim in our nearby fresh water lake - Etang de la Bonde -- it's clear spring water, and a 5 minute drive from the house. Everything is here in our little village, and at night it's peaceful and quiet. You can walk 2 minutes to the new 'hot restaurant' La Closerie, where a certain author (his latest book was made into the feature film referenced above) dines regularly or drive 10 minutes to Lourmarin for a variety of dining - from cafe casual to Michelin star. It takes 30 seconds (if you walk really slowly) to get to our Boulangerie! The chocolate croissants are sinful. Our house is the perfect haven to de-stress, and immerse yourself in AUTHENTIC French village life. In many ways you will feel you've returned to a lost era. We are always available to answer any questions and to help you plan itineraries and steer you in the right direction for a fun vacation. PRICING: VERY IMPORTANT! We quote US Dollar rates -- that ensures that when you book the price you pay doesn't increase by the time of your final payment due to currency fluctuation. Pay in Euros and you're risking a rate hike by the time you pay your closing costs. 'Your house has a lovely warm authentic feel with many original features. stunning village with lovely walks in picturesque surroundings. spacious rooms of plenty all with lovely en-suites. We loved our stay!' Gail, Liverpool, UK ..
Actually, this house chose me.....After a long hike through the Luberon over 19 years ago - we arrived in Ansouis coming up the big hill -- an invigorating walk up the road near the Musee Extraordinaire. When we stopped at the top, I caught my breathe on the corner of Place Des Hotes where the house is located. And -- That was it, I saw the house, and somehow (yes like in the movies) I wound up owning it less than 3 months later....I love this village because it is truly authentic, pristine and not over run with postcard shops and retailers. Ansouis is a village where you can walk the streets at night, close your eyes and go back in time hundreds of years. Ansouis has a profound effect on people. You will literally be swept off of your feet with its charm. I think about your stay with YOU IN MIND. What comforts are you looking for? Is the bed comfortable? Do you have the right cookware for the delicious meal you'll create after visiting the markets? Can you check in on CNN and see what's going on in the world -- just in case. Do you have free calls back to the USA? In my house, the answer is QUI! We are in the center of the village. Our life here is as we were in the center of a charming French film and the characters are walking by, baguette tucked under their arm with their trusted chiens by their side...I love sitting up on the terrace at night and watching the stars come out. As our friends say: sit back and watch nature put on a show. Well, for a village of 1000 people, the definition of downtown is an overreach....but for what it's worth...we're downtown -- the bakery, the bar, the restaurants, the mini market are very close. Set amongst vineyards, rolling hills and picturesque villages and homes. Ansouis is designated as one of the MOST BEAUTIFUL VILLAGES IN FRANCE. fully automatic on main floor/living dining area, all bedrooms. We have a furnace and radiators in all bedrooms, plus inverter heaters, comforters and blankets. 400 + thread count sheets, plush, American size towels. Yes, in a newly renovated laundry room adjacent to most bedrooms. There is FREE parking in the village -- and the car park is about 50 yards from the front door. Free Wifi, secured and log in information is provided at our house. Totally free calls to the USA and Canada and throughout Europe. We've furnished the kitchen with high quality kitchen tools such as Oxo. Nespresso Cappucino/Espresso maker, food processor, stand mixer, rice cooker, George foreman grill too! spices, some condiments and mixes. lovely dinnerware from Crate and Barrel, OXO, etc. Wonderful private chef available by advance booking. She'll cook in the house for a party OR she'll deliver. Will work with your likes/dislikes and food allergies. Fully equipped, as I've been in the culinary business my entire career. yes, we have Alexa....Amazon Echo device s for your news, music and more. We have 2 grills. A gas BBQ off in the atrium at ground level and a Weber charcoal grill up on the roof terrace. super cool lounge on the terrace upstairs. very cool lounge upstairs with small summer kitchen adjacent. Amazing! Perfect place to enjoy the benefits and relaxation of the Valcuse Country side. The place was clean bright and extremely spacious with a outdoor patio for grilling and rooftop veranda for sunning are enjoying a glass of Rose de Provence! We highly recommend this accommodation and in fact already have sent friends and friends of friends this way! The owner listed out daily events in the in and around the immediate area allowing us to live like the locals! From tiny Sunday Markets, Truffle hunting in Cadenet, wine tasting and art walk at L Coste Vineyard, a week was not long enough! Extended day trips to Cassis, Avignong and Chatenuf de Pape made the week barely enough. We hated to leave and continue on to Paris! We're super happy you enjoyed your stay. And that you appreciated the coziness of the house even during chilly December weather! Thanks again, please come back and experience what we have to offer in spring and summer! Walking through the front door, you sink into the relaxed comfort of a French village home. While settling into a soft chair by the fireplace (it was December after all), you can close your eyes and transport yourself to France of another era. Don’t be fooled: with modern communications, bathrooms, kitchen, and ensuite heating/airconditioning, this is as up to date as you could desire. It is a perfect, flexible all-season guest house, situated in a charming village in the heart of Provence. Your host, Barbara, is attentive, engaging, and a repository of local lore. I unabashedly recommend this property, and look forward to a return visit. Paul, thanks so much for your lovely review and most of all for choosing to stay in my house! We strive to furnish the creature comforts and coziness you'd expect and welcome your stay again. You and yours are the perfect guests ~ please return anytime, and we'll make sure there's an open week or two ;-)) for you! This was my third stay at this charming village retreat in the heart of Provence and it proved to be the perfect venue for a gathering of friends. The house is situated in the center of the village in an 18th century manse with 5 bedrooms, 3 of which are ensuite. From the moment you walk into the large salon with fireplace and courtyard, you are swept into another world and era...with all of the modern amenities at hand. The kitchen is totally equipped with all the latest appliances and conveniences. On the top floor of the house, there is a canopied terrace with lounging couches that is ideal for relaxation on a sunny Provencal day in the spring, summer or fall. Each of the ensuite bedrooms is cozy and inviting. We had four couples staying in the house for a reunion celebration and the sleeping arrangements could not have been easier...everyone was content which is unusual in a group of our size! Despite being in the heart of a charming village, parking is absolutely no problem with two lots within a short walk of the house. Additionally, the village of Ansouis offers a true Provencal experience in that it does not seem to be overwhelmed by tourists...it is delightful to wander the small streets and alleys up to the chateau and church with stunning views of the surrounding countryside. If you are looking for charm, location and comfort for a group of friends or family, this is an ideal choice! FANTASTIC CENTRAL LOCATION __ This village is the perfect base for touring historic places,shopping the markets, COOKING, visiting vineyards and golfing.